Decorating and furnishing one’s front porch can be viewed, in my opinion, two different ways: coordinated and classic, or eclectic and refurbished. Both are modes in which the homeowner can portray not only their personal decorating style, but also can create an inviting space for family and friends. Mornings spent chatting with old friends, or afternoons enjoyed catching up on some reading or handwork, are all better enjoyed on a comfortable and colorfully decorated porch. “As you ring in the summer when the family living room is transferred out-of-doors, it means a great deal to have the outside so furnished that it is a pleasant place to spend one’s leisure hours. By furnished, I mean not so much the chairs, settees, or tables, but the accessories that go so far toward creating out-of-doors an atmosphere of sunny welcome both to the members of your family and to the guests who by chance come to visit your home. 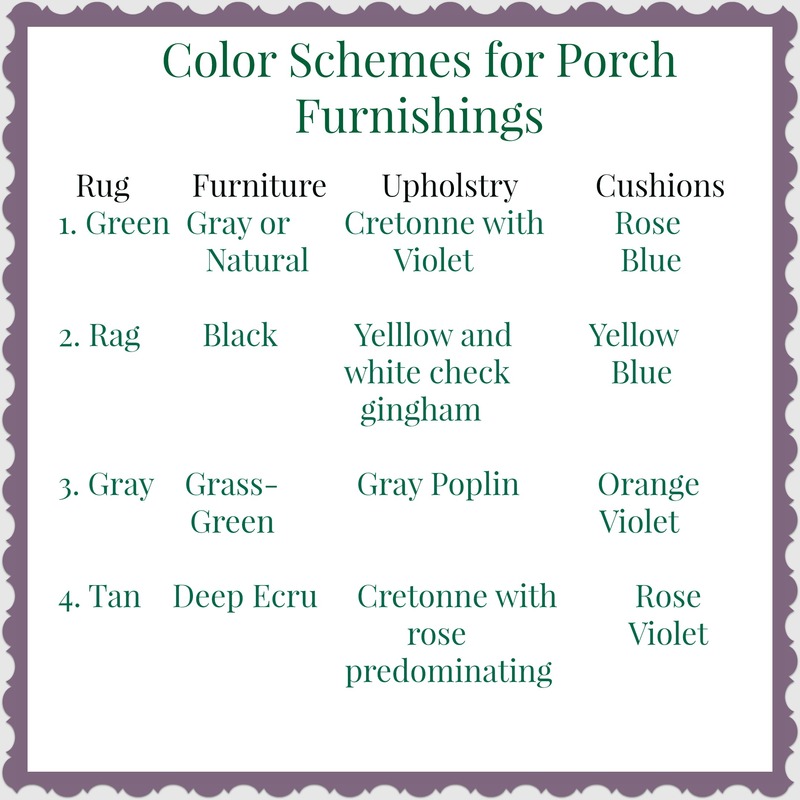 Because color is so much a part of summer, it may be used more freely on porches and decks that would be possible indoors. Once you decide on a color scheme, be sure it is carried out in the rug as well as the materials used for cushions or chair upholstery. These materials should always be durable and sunfast, if possible; so you will find cretonne, gingham, chambray, and cotton duck fabrics best not only for their color choices, but also for the ease with which they can be laundered.